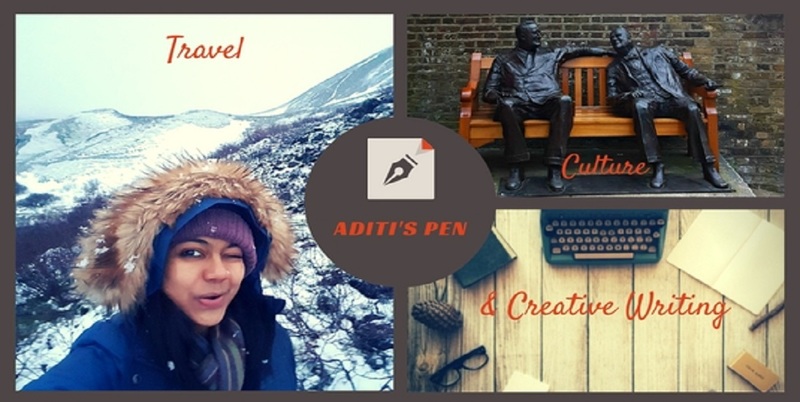 Aditi's Pen: Hiya from London! Little over a fortnight since our Big Move to a new country, new city and soon a new home, I have missed blogging and connecting with all of you. The thing about writing is, if you don't do it regularly, the words start treating you as a stranger and as much as you want to pen down your thoughts they stubbornly stay put in your head. So yeah I've been struggling a bit, but here I am now...Hiya from London!! I haven't unpacked yet as we are moving from our temporary office accommodation to our cosy home in about two weeks, so living out of suitcases literally, we are still in the holiday mood. The diverse London street food with chilled beer cans, sure are finding place on my hip, but livin' it I am and my exercise regime can wait. Last week, the May holiday offered a nice long extended weekend and though the tricky London weather which we had heard so much about kept to its name, we stepped out with bright smiles. 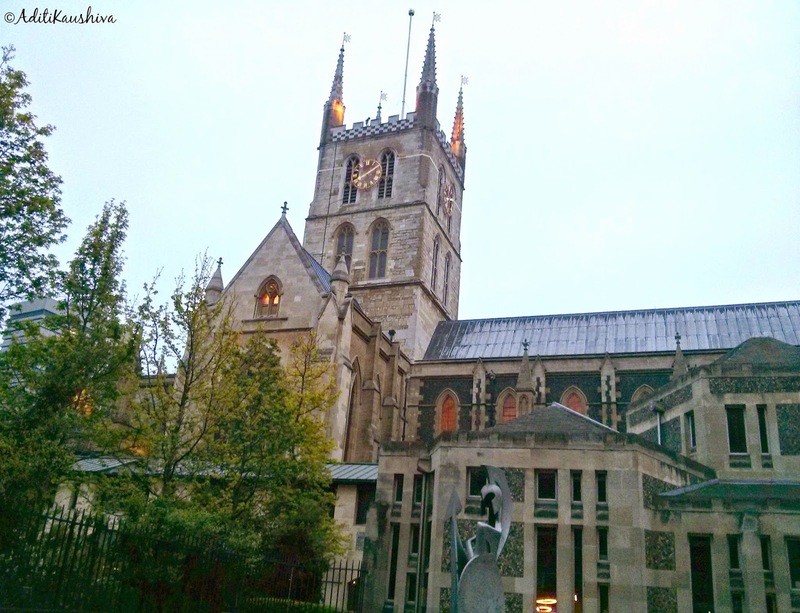 A walk along the Thames river, from Tower Bridge to Westminster was very romantic. The below lines from Wendy Cope's poem 'After the Lunch' fits in quite perfectly; the weather conditions did bring tears to our eyes and our hands were numb. Since we were on the side of Tower of London, we had to cross the Tower bridge to the other side to start our Thames path walk. All across the path, you have benches around to relax and soak in the view. We did too, while enjoying a hot plate of fish n chips. The most admirable and loveliest things about London is, how well they have preserved their ancient buildings. You can find a grand looking architectural treasure squeezed between a tiny lane or merged along with modern office spaces. 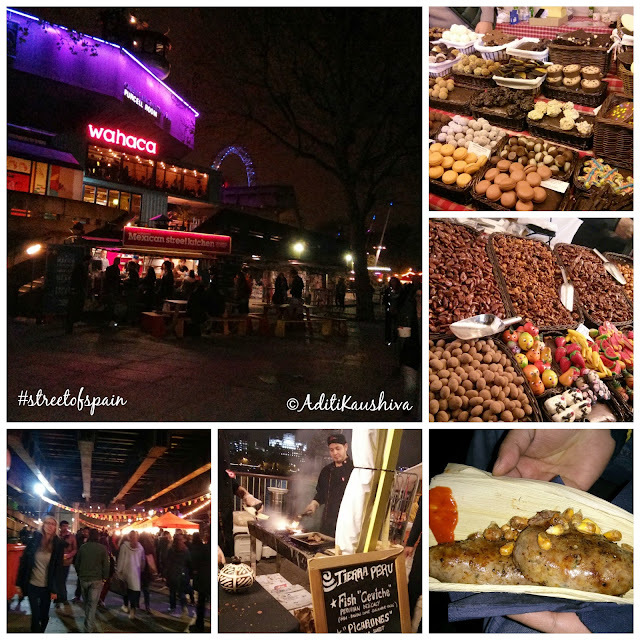 We crossed the OXO wharf tower to be met by a sweet surprise; The #streetofspain festival was in full swing at the South bank centre. We had just found a place on one of the terraced steps but the unpredictable rains brought us to our feet in no time. We briskly walked to complete our walk, the best sights left for the last. Until my next London adventure, which I hope is soon, makeitbeaYOUtiful! Awesome pictures. Moving to a new country has to be an adventure. I love London.. missing it. Hi Adi! So glad that you are back on your blog! I am sure you will have lots of beautiful experiences to share. Loved the post and the awesome clicks! Amazing pictures, hope i could be in London one day. Thanks Alok, hope it is soon for you! Great Parul, it's a plan then! Wow! You gave us a quick glimpse of London with its landmarks,old and modern.Best wishes for happy settling down. The weather is really tricky here Elly but I'm enjoying all the same! Those are some great pictures there, Aditi! Good to see that you are getting the time to enjoy the sights and all the street food. All the best for your new beginnings there. wow! congratulations to you on your move! i do hope you can get settled soon!